Aside from pieces of rare woods actually in the casting itself, these woods and other decorative materials as well are frequently used in combination with plastics in costume jewelry and other articles. The special cement used in cementing plastics will adhere firmly to wood as well as to some metals. The rough piece of wood is cemented to the rough plastic piece, then the two are worked as a whole—carved, sawn, ground, sanded and polished, producing some startling effects. Here is real scope for the ingenuity of the designer. I have even seen some particularly intricate piece of beautifully-grained wood cemented to a flat-topped ring-shape, and the whole then ground to the shape of a high-domed costume ring and polished, looking like some strange and unheard-of jewel. (See Plate 3E as an example) . Under the chapter on Findings will be found a description of the use of metals and metal ornaments in combination with plastics. PLATE Y. (Above) The author, operating; a popular type of gem-catting and faceting machine, with which unusual carving and faceting) effects can be easily snd quickly achieved in plastics. PLATE Z. (Below) Boring cylinders with conventional metal-working equipment. PLATES 2A, 2B. 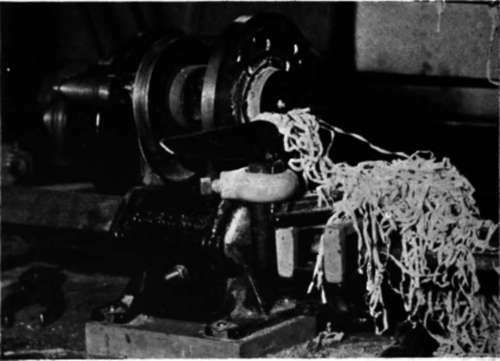 Two popular types of the small high-speed electric hand-grinders referred to in the text. 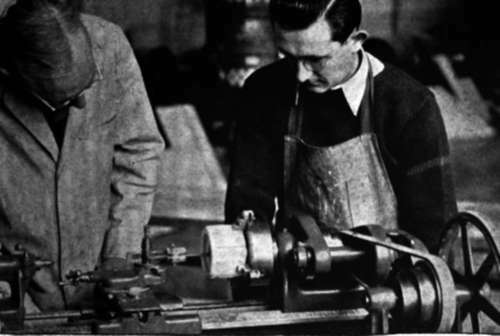 Above, a ball-bearing: model with a steel cutter, being osed for "face-plate turning". 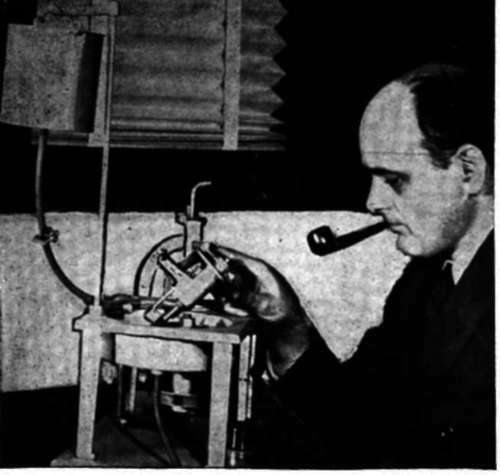 Below, another model, using a cylindrical mounted stone, being osed to rabbet a groove on the edge of a box-lid... These two operations are also illustrated in Figures 12 and 13. PLATE 2C. 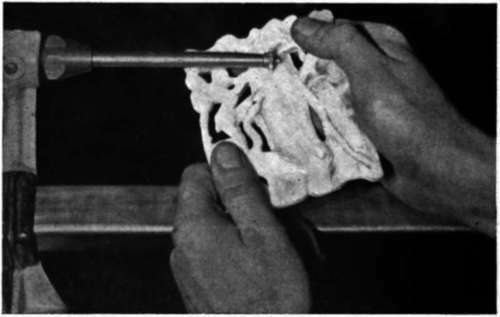 (Bottom) Home-made carving-spindle and cutter, in use on a light wood-turning lathe, carving the jade screen described in Project No. S8. The two alloys containing cadmium do not tarnish readily, but in contact with water undergo rapid oxidation. It will be seen that the melting-point of all of these alloys is below the point at which damage could be done to the plastic, so if the surface to be covered is not so large so that shrinkage of the metal on cooling would free it from the undercut, they will hold well. If the surface is too large, little metal pins or drive-screws could be inserted out in the open space, and the metal would flow around these and anchor itself. Another method of securing the metal inlay to the object is to drill small holes clear thru the material, countersinking them slightly on the opposite side. When the metal flows thru these holes and hardens it is of course firmly anchored for life. Still another method is to jig-saw the design clear thru the object, either as a fine outline line, the width of the blade alone, or a solid pattern. Previous to the development of the above method, this season, the only methods of combining metals with plastics were to wind it around, fit it into grooves or attach it with screws, all of which methods had obvious disadvantages. With this new method, there is also an unlimited field of design opened up, as the shape of the metal ornamentation can follow any lines that can be carved, instead of being restricted as heretofore to the shape of the metal ornaments that could be bought. Various other materials have been combined with plastics from time to time, and there is a wide field for experimentation. Gem-stones and cut glass gem-shapes and brilliants are examples. These are held in place with cement which, while it cannot always be depended upon to adhere firmly and permanently to glass, serves to hold the glass or stone ornament firmly in place by means of an undercut in the routed depression into which the ornament is set, and a slight taper on the ornament itself. This idea is illustrated in Figure 16, showing how the cement after hardening, provides a permanent "lock" which holds the ornament. Combining plastics with other materials, not only in costume jewelry but in all other types of projects, offers a very interesting and restful field of design and experiment, well worth looking into. Even more effective however is the idea of using small amounts of plastics as ornamentation for other materials, such as wood and metal. The brilliant color and finish of a small plastics knob on an electric percolator, for instance, often does more to sell that particular percolator than all the chrome-plate and gadgets in the world. So little material is needed to produce such a striking effect that a glance at any show-window will show how plastics has entirely revolutionized the art of commercial design. They are now even putting it on dresser handles, door-handles and countless other appliances and household articles, and in each case just this little spot of scintillating color is the focal point of the buyer's attention, whether he or she realizes it or not. The homecraftsman will do well to follow suit, and keep a couple of rods or sheets or bright colors on hand to provide the "finishing touch" for his next masterpiece.